For other uses, see Lagonda (disambiguation). Lagonda is a British luxury car marque established in 1906, which has been owned by Aston Martin since 1947. The marque has had a non-contiguous presence in the luxury car market, being dormant for several times during its existence, most recently from 1995 to 2008 and 2010 to 2013. Lagonda was founded as a company in 1906 in Staines, Surrey, by a Scottish-American, Wilbur Gunn (1859–1920), a former opera singer. He became a British national in 1891 and worked as a speed boat and motorcycle engineer in Staines, England. He named the company after the Shawnee settlement "Lagonda" in modern-day Springfield, Ohio, the town of his birth. This is a glacially eroded limestone gorge of much beauty. Historically, the area played a major role in the Treaty of Easton and the aligning of the Shawnee tribe with the British during the French and Indian War. He had originally built motorcycles on a small scale in the garden of his house in Staines with reasonable success including a win on the 1905 London–Edinburgh trial. In 1907 he launched his first car, the 20 hp, 6-cylinder Torpedo, which he used to win the Moscow–St. Petersburg trial of 1910. This success produced a healthy order for exports to Russia which continued until 1914. In 1913 Lagonda introduced an advanced small car, the 11.1 with a four-cylinder 1099 cc engine, which by 1914 featured a panhard rod and a rivetted monocoque body and the first ever fly-off handbrake. The ratchet control button on the end of a fly-off handbrake is designed to work in the opposite way to what is normally accepted. If the lever is lifted or pulled back to the "on" position, on letting go it immediately releases unless the end button is pressed and held in place before letting go of the lever. Once set, the brake is released by lifting the handbrake lever (not pushing the button) in the setting direction (up or back). This mechanism was traditionally fitted to sports cars to facilitate a racing get-away, such as at traffic lights. It can also be used to help the back wheels to slide, without the worry of the ratchet leaving the brake on. During World War I Lagonda made artillery shells. After the end of the war the 11.1 continued with a larger 1400 cc engine and standard electric lighting as the 11.9 until 1923 and the updated 12 until 1926. Following Wilbur Gunn's death in 1920, three existing directors headed by Colin Parbury took charge. The first of the company's sports models was launched in 1925 as the 14/60 with a twin-cam 1954-cc 4-cylinder engine and hemispherical combustion chambers. 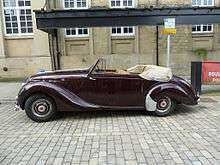 The car was designed by Arthur Davidson who had come from Lea-Francis. A higher output engine came in 1927 with the 2-litre Speed Model which could be had supercharged in 1930. A lengthened chassis version, the 16/65, with 6-cylinder 2.4-litre engine, was available from 1926 to 1930. The final car of the 1920s was the 3-litre using a 2931-cc 6-cylinder engine. This continued until 1933 when the engine grew to 3181 cc and was also available with a complex 8-speed Maybach transmission as the Selector Special. 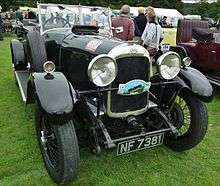 A new model for 1933 was the 16–80 using a 2-litre Crossley engine with pre-selector gearbox from 1934. A new small car, the Rapier came along in 1934 with 1104 cc engine and pre-selector gearbox. This lasted until 1935 but more were made until 1938 by a separate company, D. Napier & Son Son of Hammersmith, London. At the other extreme was the near 100 mph (160 km/h) 4.5-litre M45 with Meadows-supplied 6-cylinder 4467 cc engine. An out and out sporting version the M45R Rapide, with tuned M45 engine and a shorter chassis achieved a controversial Le Mans victory in 1935. Also in 1935 the 3-litre grew to a 3.5-litre. All was not well financially and the receiver was called in 1935, but the company was bought by Alan P. Good, who just outbid Rolls-Royce. He also persuaded W. O. Bentley to leave Rolls-Royce and join Lagonda as designer along with many of his racing department staff. The 4.5-litre range now became the LG45 with lower but heavier bodies and also available in LG45R Rapide form. The LG45 came in three versions known as Sanction 1, 2 and 3 each with more Bentley touches to the engine. In 1938 the LG6 with independent front suspension by torsion bar and hydraulic brakes came in. He was Rootes' retail sales manager for the London area until 1935, when he became managing director of Lagonda, Ltd. He is a production expert, who during the war organised and controlled for Lagonda one of the largest British gun production plants, and also plants which produced 50,000 25 lb shells a day. Watney also developed and produced the "Crocodile" and "Wasp" flame-throwing equipment for armoured vehicles." Watney finished second at Le Mans in 1930 driving a Bentley. He returned to Rootes in 1946, and posted to Australia, was killed in a car accident in Melbourne in 1949. In 1947 the company was taken over by David Brown and moved in with Aston Martin, which he had also bought, in Feltham, Middlesex. The old Staines works at Egham Hythe passed to Petters Limited, in which A.P. Good had acquired the controlling interest. Production restarted with the last prototypes from W. O. Bentley, the 1948 2.6-Litre with new chassis featuring fully independent suspension. Its new 2580 cc twin overhead cam straight 6 became the basis for the Aston Martin engines of the 1950s. The engine grew to 3 litres in 1953 and continued to be available until 1958. Many thought that the marque had disappeared, but in 1961 the Rapide name was resurrected with a four-door saloon based on the contemporary Aston Martin DB4, with an aluminium body by Carrozzeria Touring of Milan and a 3995 cc engine capable of taking the car to 125 mph (201 km/h). By this time, Aston Martin-Lagonda as it now was, had moved to Newport Pagnell in Buckinghamshire. The Rapide lasted until 1965. In 1969 the Lagonda name was briefly resurrected, appearing on a four-door prototype of the then new DBS model. The prototype was allocated chassis MP230/1 and was retained by the factory until 1972 and used by Sir David Brown as his personal car, registered JPP 5G. The car originally ran a prototype 5-litre V8 engine but this was quickly replaced by an early 5.3 litre production quad carb version (VS4008EE). Between 1974 and 1976, seven Lagonda four-door saloons were produced based on the 1969 prototype. The production models adopted a single headlight treatment with a Lagonda 'horseshoe' grille in place of the twin headlamp treatment of the prototype. In 1976 a new Lagonda saloon appeared, the large and futuristic Aston Martin Lagonda designed by William Towns. This low, rather square, wedge-shaped car was built on Aston Martin V8 components and was available, at least in theory, until 1989. Aston Martin produced a concept car called the Lagonda Vignale at the 1993 Geneva motor show. During 1993–94, a handful of Lagonda 4-door saloons and shooting brakes based on the Aston Martin Virage were built. They could be ordered with the 5.3-litre V8 (310 HP) or the 6.3-litre V8 (500 HP). Production numbers Lagonda Saloon (8 or 9 cars), Lagonda Shooting Brake 5-doors (1 or 2 cars). Aston Martin said on 1 September, 2008 as reported by Automotive News Europe that it would relaunch its Lagonda brand to help it expand into new markets such as luxury sedans and celebrate Lagonda's centennial anniversary in 2009. "The Lagonda brand would allow us to develop cars which can have a different character than a sports car," said CEO Ulrich Bez in a statement. "Lagonda will have its own niche with luxurious and truly versatile products suitable for both existing and emerging markets". "Lagonda models would be vehicles that could be used all year round in markets such as Russia where specialized sports cars such as Aston Martins could only be used for three or four months each year", said Aston Martin spokeswoman Janette Green. At the 2009 Geneva Motor Show, Aston Martin unveiled a 4WD, 4-seat SUV to commemorate the 100th anniversary of the first Lagonda car. It includes a V12 engine and 22-inch wheels. The Rapide name was revived in 2010 as the Aston Martin Rapide saloon. Aston Martin confirmed the revival of the Lagonda brand on 9 March 2011. The new range would initially consist primarily of high-end SUVs. In 2014, however, Aston Martin announced a large, low-bodied saloon version, the Taraf, to be sold exclusively in the Middle East. 1 2 3 4 5 6 7 G.N. Georgano, N. (2000). Beaulieu Encyclopedia of the Automobile. HMSO. ISBN 1-57958-293-1. ↑ "Nachtschicht im Schloss: A report on a concours d'elegance at Schloss Bensberg". Auto Motor u. Sport. Heft 25 2010: 45. 18 November 2010. ↑ "My kind of car: Lagonda 16/80 1932". Drive (Magazine of the British Automobile Association). 115: 66. February 1985. ↑ "British Tradition from an American". The World of Automobiles. 10. Columbia House. 1974. p. 1129. ↑ Apra l, K. "Lagonda 1930". www.classiccarcatalogue.com. Retrieved 10 July 2013. ↑ The Autocar, 21 June 1935, Pages 1115-1124b. ↑ The Manchester Guardian, 26 April 1935, Page 12. ↑ New York Times, 17 October 1939, Page 16. ↑ The Sydney Morning Herald, June 14, 1946, Page 1. ↑ The Argus, Melbourne, Victoria, 10 August 1949, Page 5. ↑ The Manchester Guardian, 11 February 1953, Page 2. ↑ Lavrinc, Damon (4 March 2009). "Geneva 2009: Aston Martin revives Lagonda to questionable effect". Autoblog.com. Retrieved 2010-12-25. 1 2 3 4 Baldwin, N. (1994). A-Z of Cars of the 1920s. Bay View Books. ISBN 1-870979-53-2. ↑ G.N. Georgano, G. N. (1968). The Complete Encyclopaedia of Motor Cars. George Rainbird Limited. 1 2 3 4 5 6 Sedgwick, M. (1989). A-Z of Cars of the 1930s. Devon, UK: Bay View Books. ISBN 1-870979-38-9. 1 2 3 Sedgwick, M. (1986). A-Z of Cars 1945–1970. Bay View Books. ISBN 1-870979-39-7. Wikimedia Commons has media related to Lagonda vehicles.